It’s December in New York City and the temperature continues to drop as the holidays arrive. The new year approaches with certainty and forcefulness, like the final train at Penn Station on a Saturday night. Piercing winds fly across avenues and around street corners as New Yorkers spend their Christmas bonuses on expensive gifts and stiff cocktails. Tourists wander around midtown, viewing the city through their iPhone cameras. To me, this time of year represents a color wheel of emotions, mostly gratitude for being alive and semi-healthy. I have fond memories of the city during the holidays, it’s embedded in me as I was born here twenty-five years ago. There’s a sense of magic that washes over the harsh realities for a week or two, and that’s exactly what we sometimes need. Hanukkah is underway, Christmas is in sight, and New Year’s Eve is close behind it. In under two weeks, there will be close to a million people in and around Times Square to watch the ball drop. People will confide in each other to help convince themselves that it’s somehow worth it to embrace the utter chaos. There will be strangers kissing each other, fighting each other, and puking on each other – it’s the exact definition of madness. And while this madness is taking place, myself and 2,000 lucky individuals will be underground, tucked away in the cavernous Playstation Theater with our favorite band, The Disco Biscuits. At this point in my life, seeing the Disco Biscuits on NYE is as routine as the holidays that I mentioned above. Almost every year, like clockwork, The Disco Biscuits and their crew return to the Playstation Theater at the end of December for a trance-fusion extravaganza. After changing things up and playing the Tabernacle in Atlanta last year, they’ve returned to the dungeon that their fans have come to love. Some of you may still refer to it as the Nokia, or Best Buy, but that’s beside the point. The venue has become a monumental setting for 2.0 Biscuits as they’ve played some of their best shows to date there. It’s as if the urban theater was specifically designed for the Biscuits and their fans, with multiple levels and excellent sound, you’re almost guaranteed to have a memorable experience. We all know how comfortable the band is playing there, their risk-taking is usually at an all-time high. I’ve had some of the best experiences of my life seeing the Disco Biscuits level the Playstation Theater, God only knows what’s about to happen this year. I mean, let’s look back at some of the shows that they’ve played there over the last ten years: 4/11/08, 12/28/08, 12/30/09, 12/28/13, 12/31/15, and 1/2/16. Each of these shows stand out for their respective time periods, and helped solidify Playstation Theater as one of their favorite venues. I want to focus on what took place during their last run of shows In the dungeon, those that were in attendance will never forget. On 12/31/15, the Disco Biscuits executed something that only they could do at that level, they played an improvisational score to the 1982 science-fiction film TRON. I still get chills thinking about the moment that we all realized what was about to happen. I always heard the stories of them playing behind the 1988 anime film AKIRA on New Year’s Eve of 1999, people that were in attendance cherish the experience to this day. 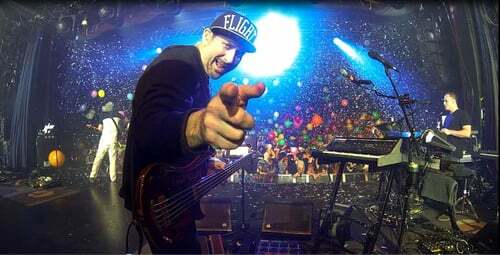 I wondered if I’d ever get to experience something similar, so much so that I asked bassist Marc Brownstein about it in an interview leading up to NYE in 2015. As you can probably imagine, a shock was sent through my nervous system when the unthinkable occurred. I’ve become close friends with many of the people that were in the venue with me that night. It’s a wrinkle in time that only we got to experience and there’s something extremely special about that. Here we are, two years later, gearing up to return to the infamous Playstation Theater for four nights of the Disco Biscuits. A lot has happened since that night, the band has continued to revitalize their chemistry and push themselves to new heights. They’re not the same band that they were in 2009, and they’re definitely not the same band that they were in 2012, and that is completely fine with me. As I sit here and write this, my mind explores the possibilities of what might take place over the course of this upcoming run. The raw musical sorcery created by these four men has been engraved into my genetic makeup, for better or for worse. Their music has slammed open new doors like a battering ram in an early morning raid, undeniable and unforgiving. I think back and realize that it’s what I’ve always been looking for, what I’ve always yearned for. It’s technical and extraordinary yet simplistic and soulful. It’s raw and undiluted yet palpable and expansive. The Disco Biscuits were put on earth to push improvisational music into the next frontier. Seeing them live is like getting shot by a rubber bullet, it’ll definitely leave a mark, but you’ll survive. The biggest thing of all? They’re as authentic as can be. And whether you love it or hate it, The Disco Biscuits will go down as one of most progressive bands in the history of live music. In less than two weeks, the corner of 44th and Broadway will be transformed into a scene that most of us are all too familiar with. It’s not going to be easy for the Biscuits to top what they did two years ago, but if we know anything about this band, it’s far from impossible. If 2017 has shown us anything, it’s to expect the unexpected, who knows what the Disco Biscuits have up their sleeves. The only thing that matters is that they show up in New York City ready to play mind-blowing music, whatever happens next is out of our hands. I’ll see you on the dancefloor.